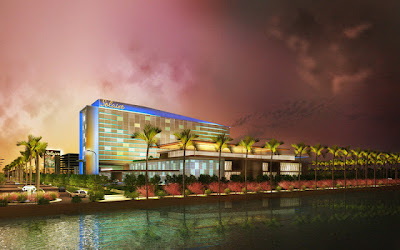 Pagcor's Entertainment City or most popularly known as PAGCOR CITY is a 120 Hectares Las Vegas-like Entertainment complex that will house Hotels, restaurants, casino's and other amenities that will rise in the Manila Bay Reclamation area at Paranaque City, Philippines. Pagcor have chosen 4 company to operate inside the Entairtainment City and require a minimum $1-billion investment each. Each licensee is also required to build a minimum of 250,000 square meters of floor area and complete 800 hotel rooms with an average room area of 40 sq m. Everything must be in order before the casino inside the complex opens. The four companies granted licenses to build, Bloomberry Resorts Corp., Belle-Leisure and Resorts World-Melco consortium, Malaysian gaming firm Genting, in partnership with Alliance Global and Okada Azure's Universal Entertainment. • Each proponent is committed to invest at least US$1 billion for the integrated resort they are building in Entertainment City. o Each proponent is required to invest at least US$650 million of their US$1 billion commitment. o Each proponent must construct a minimum of 800 hotel rooms. o Each integrated resort must have a minimum of 250,000 sq. m. of gross floor area, with each proponent’s gaming area not exceeding more than 7.5% of their gross floor area. o Each proponent is required to have a minimum of 20,000 square meters of retail spaces. o Each integrated resort should provide a thematic attraction worth at least US$20 million. o Aside from the minimum 4 billion US Dollar investment commitment, the Entertainment City project will foster large-scale development. o The resorts will have a capacity to accommodate a million tourists. o Based on the Philippine government’s tourism blueprint, the National Tourism Development Plan (NTDP) seeks to achieve for the country 10 million tourist arrivals by 2016. That means one tenth of the target for the whole Philippines can be generated from the Entertainment City. o The project is also expected to provide direct local employment of at least 40,000.
former site of Nayong Pilipino, a once-famous tourist destination in Manila. Bloomberry Resorts Corp.’s Solaire Manila project costs over $1 billion and will have a 700-room hotel, bayside villas, 1,200 slot machines and 300 gaming tables. It will also have a 1,000 seat grand ballroom, spa and fitness center, and a bay view promenade. Other features include a multilevel parking building with 3,000 parking slot. Pagcor guidelines require a minimum $1-billion investment in each integrated resort. Each licensee is also required to build a minimum of 250,000 square meters of floor area and complete 800 hotel rooms with an average room area of 40 sq m. Everything must be in order before the casino inside the complex opens. Solaire Manila is set to open in First quarter 2013.